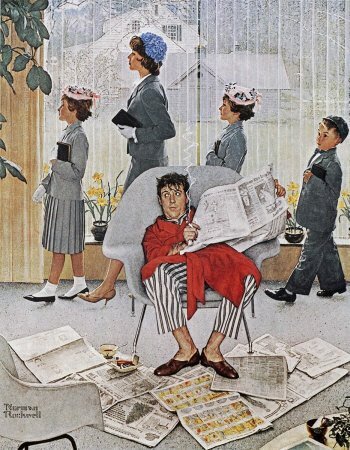 Easter Morning, a Norman Rockwell painting , appeared on the cover of The Saturday Evening Post published May 16, 1959. This is another timeless favorite of Rockwell collectors, a classic for all the ages. This painting was Rockwell's 305th overall out of 322 total paintings that were published on the cover of the Saturday Evening Post. Rockwell's career with the Post, spanning 47 years, began with his first cover illustration, Boy With Baby Carriage in 1916 and continued through his last, Portrait of John F. Kennedy, in 1963. This was also the second cover for The Post in 1959. In 1959, there were four Norman Rockwell Saturday Evening Post covers published. The original oil on canvas painting, 53 x 49 inches or 134.6 x 124.4 cm, is part of a private collection. on page 223 of Norman Rockwell, A Definitive Catalogue by Laurie Norton Moffatt. One study is also reproduced on page 224 of the Norman Rockwell Catalogue. Norman Rockwell gives us a humorous glimpse into family life on Sunday morning. This poor fellow has been unfairly picked on. This may actually be his first Sunday to stay at home in a month or more. Rockwell apparently felt that the man was somewhat of an imp, as he painted horns into his disheveled hair. We do not know if he started his newspaper with the sports section, but that is what he is reading at present. The othr sections of the newspaper do not look read yet. His coffee cup and his ashtray rest on top of some of the sections. He enjoys a cigarette as he slumps into his chair, trying not to be conspicuous. The man's family is all decked out in their Sunday best, walking single file to the door, headed out to worship. His wife, modeled by Gail Rockwell, wife of Thomas Rockwell, Norman's oldest son, is giving him the cold shoulder. She has probably had the argument about his non-attendance before and doesn't wish to compromise her own attitude with another discussion. The twins areboth modeled by the same girl, a technique Rockwell first utilized in 1948's Christmas Homecoming. They echo mother's bearing and resoluteness not to even glance in his direction. Only the son glances in his father's direction, as if to say "Can I stay home, too?" The son can see those funny papers beckoning him. Easter Morning was only one of 322 Norman Rockwell Saturday Evening Post covers; Here is the list of Norman Rockwell Saturday Evening Post cover illustrations. This painting was not published until after Easter in 1959. Easter was celebrated on March 29 in 1959. So, in my opinion, this would be better named Skipping Church. One little known detail of this painting is that the view out of the big picture window is also the view out of the big picture window at Rockwell's studio. Do You Have A Great Story, Opinion Or Contribution About Easter Morning?